Two of the four loci of region U1, fas and att, are fundamental for virulence and have been extensively studied (Goethals et al. 2001). The fas locus codes for the most important pathogenicity factor of R. fascians and mutations lead to a nonvirulent phenotype. The locus contains an operon of six open reading frames (ORFs) that encode the machinery for the synthesis of a cytokinin-like signal molecule essential for symptom development (Crespi et al. 1994; Fig. 3). The gene product of orf 1 is homologous to P450-type cytochrome monooxygenases that play a central role in biosynthetic and biodegradative pathways in actinomycetes (McLean et al. 2005). The accompanying electron transport complex is encoded by orf 2 and orf 3. The orf 2 gene product is a bi-functional protein: the amino-terminal part shows homology to ferredoxins, whereas the carboxy-terminal region is similar to the a subunit of pyruvate dehydrogenases. The P subunit of this enzyme is encoded by the gene product of orf 3. The products of these three genes constitute most probably the machinery for a single enzymatic reaction directed by the P450 monooxygenase. The central gene orf 4 codes for an isopentenyl transferase involved in the first committed step toward cytokinin biosynthesis (Crespi et al. 1992; Saka-kibara 2005). The orf 5 and orf 6 gene products show similarity to cytokinin dehydrogenases, and glutathione-(S)-transferases and lysine decarboxylases, respectively. cabies, a sporulating actinomycete and causal agent of scab disease (Kers et al. 2005). The typical disease symptoms caused by this pathogen are not related to fasciation. Under laboratory conditions, however, S. turgidiscabies is able to induce leafy galls on tobacco (Nicotiana tabacum) that are indistinguishable from R. fascians-induced hyperplasia, supporting the important role of the fas genes in this symptomatology (Loria et al. 2006). Although fas transcription is constitutive, translation of the fas messenger RNAs is highly responsive to several environmental signals. In the early steps of the interaction, it is absolutely dependent on the activity of the Att proteins that produce an au-toregulatory compound (Temmerman et al. 2000; Maes et al. 2001; Cornelis et al. 2002). Upstream of the fas genes lies fasR that encodes a key transcriptional regulator, a member of the AraC family (Temmerman et al. 2000; Martin and Rosner 2001) that is essential for fas gene expression because the fasR mutant is nonvirulent. The working model is that FasR in combination with the autoregulatory compound controls the expression of a translational activator that will mediate translation of the constitutively produced fas messenger RNAs (Temmerman et al. 2000). The actual structure of the att-encoded autoregulatory compound remains to be elucidated, but sequence analysis of the nine ORFs of the att operon (attXABCDEFGH) revealed that the gene products of att A, attB, and att H are involved in arginine biosynthesis, whereas attD, attE, and attF are homologous to proteins implicated in the formation of a ^-lactam ring. Hence, the autoregulatory compound is hypothesized to be an antibiotic-like molecule. Mutants in the att locus display an attenuated virulence phenotype, confirming the need for the Att autoregulatory compound to express appropriately fas that, in turn, is required for full virulence (Maes et al. 2001; Cornelis et al. 2002). Based on experimental data, the Att compound is proposed to be produced at a low constitutive level that steadily increases as the bacteria increase in number or get confined on the plant surface. At a certain threshold level, att gene expression is induced by AttR, a LysR-type tran-scriptional regulator (Maes et al. 2001; Schell 1993), with a steep increase in the concentration of the Att compound as a consequence. This positive autoregulation is needed for the direct or indirect onset of expression of other virulence-associated genes, such as fas. The att genes are expressed principally in bacteria located on the plant surface at early stages of infection, whereas expression of the fas locus occurs throughout infection (Cornelis et al. 2002). Besides its role as autoregulatory molecule, the compound produced by the Att proteins seems to be involved in the penetration of plant tissues. Although att mutants are capable of inducing mild symptoms on their host, unlike the wild-type strain, they require wounding to do so (Maes et al. 2001). Whether this defect is an indirect result of the poor induction of an unidentified penetration locus or whether the Att compound itself is directly involved in breaking through the plant cell wall is currently unknown. Whatever the case, the att operon obviously plays a key role in the shift from an epiphytic plant-associated to an endophytic plant-pathogenic lifestyle. For the two other loci of region U1 far less functional information is currently available. A hyp mutant exhibits a hypervirulent phenotype characterized by the early formation of larger leafy galls on tobacco, suggesting that the Hyp proteins balance virulence by either modifying the bacterial signals to a less active form or by controlling the expression level of the virulence genes (Crespi et al. 1992). Sequence analysis of the hyp locus favors the latter hypothesis because of the presence of a gene encoding a homolog of the D-E-A-D box family of RNA helicases (Vereecke et al. 1996; Temmerman 2000). These proteins play an important role in the regulation of messenger RNA expression and translation initiation (Linder 2006). Finally, located between the hyp and the att locus lies a gene cluster possibly involved in the biosynthesis of y-butyrolactone (unpublished data). In Gram-positive bacteria, y-butyrolactones function as signaling molecules that regulate antibiotic production and morphological differentiation (Takano 2006). Whether this signaling molecule plays a role during the interaction of R. fascians and its host remains to be determined. Mutation of the nrp locus located in the unique region U2 also leads to an attenuated virulence (Maes 2001). Sequence analysis of the nrp locus revealed that the six ORFs probably code for a nonribosomal peptide synthetase (NRPS) composed of five modules, suggesting the production of a pentapep-tide. NRPSs are responsible for the production of a multitude of biologically active compounds, including signal molecules and phytotoxins (Finking and Marahiel 2004). Interestingly, the dipeptidic thaxtomin secreted by phy-topathogenic Streptomyces species inhibits cellulose biosynthesis by the host and causes cell hypertrophy in expanding plant tissues, thus facilitating the penetration of the plant by the bacteria (Kers et al. 2005; Loria et al. 2006). By analogy, we are currently investigating whether the peptide produced by the NRPS of R. fascians functions as a toxin produced in the early steps of the infection process to enable access to inner plant tissues. The terminal unique region U3 contains the stk locus and harbors a five-gene operon (unpublished data). The central gene putatively encodes a bi-functional protein; the carboxy terminus is homologous to penicillin-binding proteins, and the amino terminus to RodA/FtsW cell shape/cell division proteins of the SEDS family (acronym for shape, elongation, division, and sporulation) (Noirclerc-Savoye et al. 2003). The other genes of the operon are similar to proteins involved in phosphate-dependent signal transduction and regulation pathways. 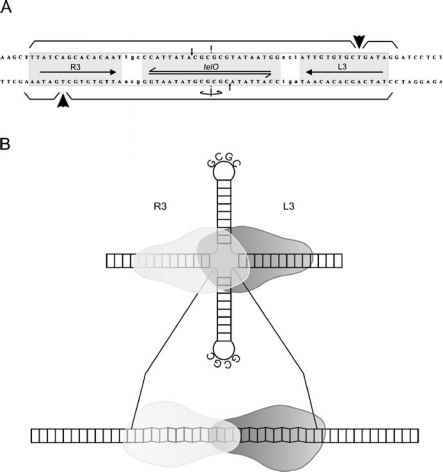 Remarkably, this operon is conserved in all acti-nobacteria sequenced to date, including Mycobacterium tuberculosis, M. leprae, Corynebacterium glutamicum, and S. coelicolor, pointing to an essential role in the cell's biology (Boitel et al. 2003; Dasgupta et al. 2006). In these organisms, the region is located on the chromosome and is vital for bacterial growth through regulation of cell division and/or cell elongation. By analogy, in R. fascians a functionally conserved operon is predicted to be located on the chromosome. Hence, the homologous copy on the linear plas-mid, which is dispensable for bacterial growth, probably results from a gene duplication event or has been acquired through HGT. Because in M. tuberculosis and Streptococcus pyogenes these proteins are involved in bacterial morphology and septation during cell division (Kang et al. 2005; Dasgupta et al. 2006; Jin and Pancholi 2006), we presently hypothesize that the stk locus of R. fascians is involved in the directional growth of the bacterium towards the plant.